While Counselor has been posting the "Deep in the Heart of Me" story, she has mentioned fresh, cooked pumpkin a few times in her author notes. I sent her a message and asked if she would share her pumpkin recipes with her readers and I could post them on this blog. The photos are from some recipe sites online, but they look similar to the combination of ingredients from the recipe. 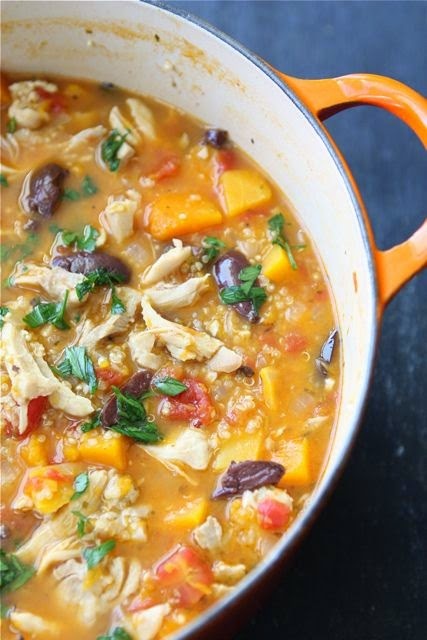 If anyone makes this at home, post your photo of the soup you make! I can't wait to try making this at home soon! 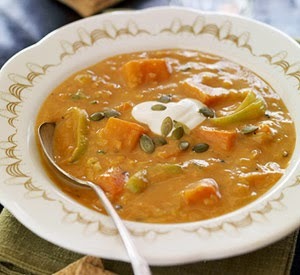 "I have this wonderful soup recipe in which I use fresh pumpkin puree. I use pureed pumpkin as a soup base (even in my chicken and cheese chowder I use a cup of fresh pumpkin. It just adds some great flavor). The fresh pumpkin is just so good. I halve the pumpkin take out the strings and seeds and bake the halves at 325 until it's soft then I run it through the blender and there's my puree. Okay, the soup is so fabulous I have to give it away. I like to use chicken thighs as they have more flavor but breasts are fine. I like a good mess of it so I use a pack of chicken thighs boneless and skinless. Cook on low for a while, or in crockpot, until everything is done. This is fall in a bowl."